Barry: Lise, you and your family travelled to Gunnedah for the 2018 Australian Senior Dirt Track Titles, which included Junior support classes, held on the 8th and 9th September. How many Taree Motorcycle Club riders were entered in the Titles? Lise: Three Junior boys and one Senior. Barry: How long did the trip to Gunnedah take you? Lise: About four and a half hours. We went via Thunderbolt’s Way – a pleasant trip. Barry: How was the meeting? Lise: “Awesome!” It hailed on Friday for five minutes. There was some rain on Saturday, which interrupted racing, but Sunday was perfect weather. Barry: How did the Taree riders go over the weekend? Barry: Great effort from these young Taree riders. How long has your son, Thoren, been riding/racing a motorbike? Is this his first Open meeting and what bike was he riding? Lise: Thoren’s been riding for three years. He’s riding a KTM and has raced in one other Open meeting but he’s really improved since then. This is his first time on the podium at an Open meeting. He was entered in the Akubra Classic in August but it was postponed due to rain. Barry: You’d be proud of his effort at Gunnedah, then. Do any other members of your family ride motorbikes? Lise: Thoren’s dad, John, rides/races. 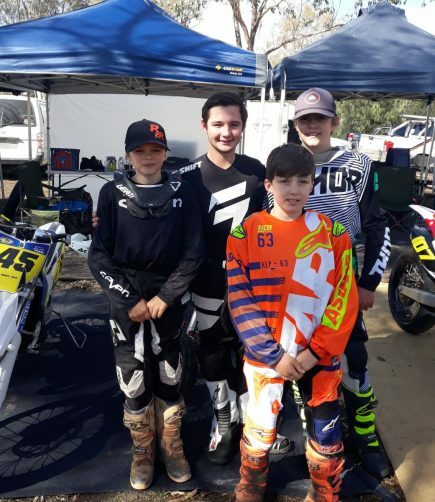 Barry: As a mother of a young Taree Motorcycle Club member who is doing really well, have you any advice for other young boys or girls who are interested in riding/racing a motorbike? Lise: Keep trying. Practice. Don’t give up. Ride to the best of your ability. Barry: Is there any other comment you’d like to make, Lise? Lise: I’m proud of all the riders who competed on the weekend. Barry: Thanks for that, Lise, and, again, well done to our Club’s riders.